When you want to have a healthy and clean home, one of the most important elements is having clean carpets. 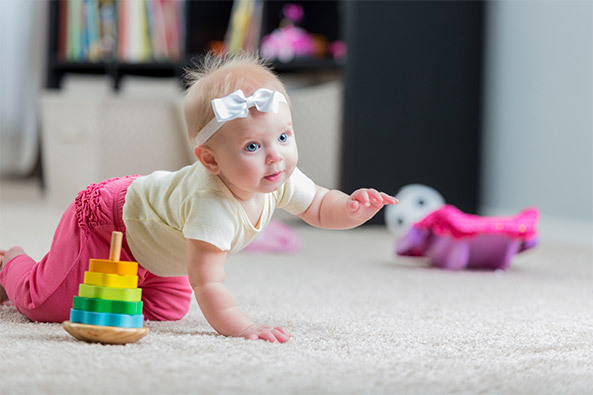 The carpets in our homes are designed to withstand a lot – traffic from kids and pets, spots and spills, and everyday wear and tear. Over time your carpets will accumulate soils, allergens, spots, and odors, and suddenly your once beautiful carpets are looking a little dirty. If it’s time to have your carpets cleaned, look no further than Pine Ridge Cleaning & Restoration! We take great care of your home and treat it as if it were our own. We always ask about pets to ensure they don’t run off during our trips to the truck and back. We use drop cloths where necessary, foot protection in areas that aren’t being cleaned, and protective corner buddies along outside wall edges to shield them. We have been cleaning carpets since 1989 and have the training, experience, and equipment to ensure you get the best results, guaranteed. Contact us today to schedule your next carpet cleaning appointment! Our certified technician will ask you for a guided tour of the areas to be cleaned to identify any points of concern you may have. Take some time to look carefully prior to our arrival so we can properly address these areas. Identify spots and stains if at all possible so we can better treat those areas. One of the most important steps of carpet cleaning is dry soil removal. Our certified technicians use a commercial quality HEPA filtered CRI Gold Certified vacuum, which greatly improves the cleaning experience. There is no additional charge for moving furniture. We kindly ask that you try to remove as many smaller items (lamps, small end tables, etc.) prior to our arrival if possible. Larger pieces will be moved for you, and placed on protective tabs/blocks following cleaning. For liability reasons, we cannot move delicate electronics, AV equipment, or pianos. Our certified technician will pre-condition the entire area with special plant-based botanical cleaning agents boosted with citrus solvents to break up soils more effectively. These are called “surfactants,” or “surface active agents.” In most cases, we proudly use green-safe cleaning agents. Better for you, and better for the environment! Troublesome stains will be addressed with the appropriate spotting agent to obtain a better overall clean. There’s no such thing as one “Do-All” miracle spotter for all stains! Point these out during the Pre-Inspection so we know how to handle them. An agitation rake or scrubber is used to gently massage the carpet fibers to loosen the soils and help the cleaning agents do their job — much like when you shampoo your hair. Agitation, coupled with dwell time, greatly improves the results. The carpet is thoroughly cleaned using high-power truck-mounted extraction. We use our own filtered, soft water that neutralizes as we clean, leaving behind virtually no residue. We also extract the moisture THOROUGHLY, meaning more soil removal and ultra-fast drying times! We pride ourselves in having the fastest drying times in the industry today. Carpet protectors – a very beneficial service – can now be properly re-applied. Did you know that, over time, foot traffic and friction (vacuuming, beater bars) can remove factory-applied protection making it important to re-apply, especially in high-traffic areas? We apply the proper amount so that you get the most out of your investment. High-speed air movers are used to force-dry the carpet. The helps prevent re-occurring wick-backs, and also rapidly decreases drying time — especially following the proper carpet protection application. Prior to packing up our cleaning tools and hoses, our certified technician will guide you through the freshly cleaned areas for your approval. We will re-clean any areas of concern. As always, WE aren’t happy unless YOU are happy! Started in 1989, Pine Ridge began as a cleaning business with a single truck. Over the years, we have evolved to include many types of home, office, or industrial cleaning & restoration services and maintain an entire fleet of vehicles. We attribute our success to a steadfast commitment to our mission: to provide high quality, comprehensive cleaning and restoration solutions while delivering extraordinary customer service – all driven by a family owned and operated approach.